Huge, mysterious gaping holes in Northern Siberia may not be such a mystery anymore. One scientist has pinned down a cause and, spoiler alert, it’s not aliens or weapons testing, as had been theorized. 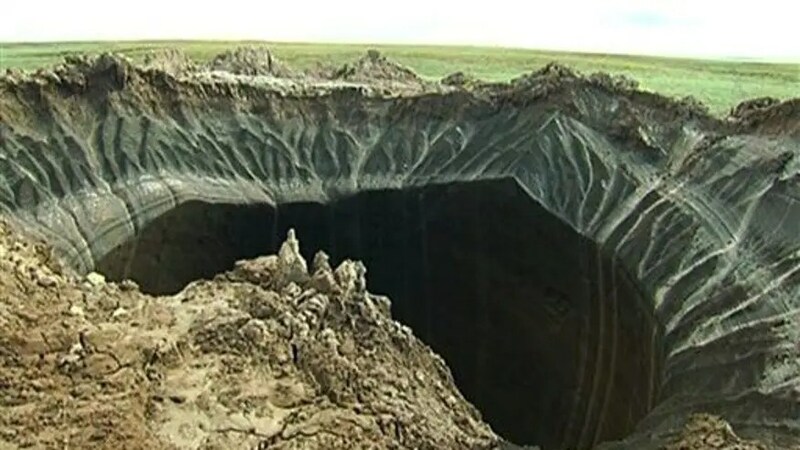 The first hole discovered in the Yamal Peninsula, which is 260 feet wide, is likely a sinkhole caused by melting ice or permafrost, University of Alaska geophysicist Vladimir Romanovsky tells LiveScience. But rather than swallowing the earth as it opened up, he speculates, the hole “actually erupted outside,” tossing dirt around the rim. (One caveat: Romanovsky hasn’t seen the holes himself, but he has spoken to Russian colleagues who have, notes PRI.) He suspects natural gas caused pressure to build as the water collected in an underground cavity, and the dirt—which is reportedly piled more than 3 feet high around the edge of the crater—was eventually expelled. Plants around the crater suggests the hole is several years old, but closer inspection is needed to determine the exact age. Romanovsky thinks climate change played a role, which means “we will probably see this happen more often now,” he says.